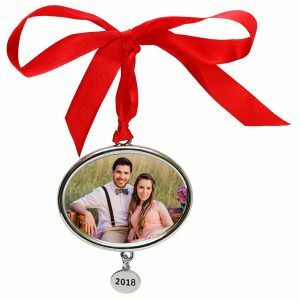 Take photos from your phone, tablet or laptop and create a custom photo Christmas ornament that keeps your memories alive. We have a variety of styles to choose from so you can instantly add your own personal touch to any holiday display in your home. Make your own ornament in minutes using our convenient project editor and transform your Christmas tree into a gallery of photographic treasures! Speaking of the holidays, we have a wide range of creative photo gifts for everyone on your shopping list! Create a photo ornament accompanied by a personalized photo calendar for the perfect gift set this holiday! Make your own ornaments with just a few simple steps. Begin by choosing your photos and uploading them online or directly from your phone. In minutes, you can customize your own holiday keepsakes for display on your Christmas tree, mantle or anywhere in your home. First, choose your ornament to get started. Afterwards, you will choose your ornament’s template background depending on which ornament is selected. Then, you can upload your photos to use for your project. Finally, drop your photos into place and add your own text. Once you have finished, simply add your ornament to the cart and place your order. 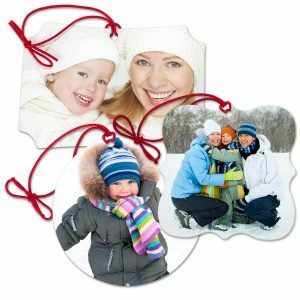 Each photo ornament comes with its own hanging ribbon so it can be instantly displayed anywhere in your home. Brighten up your mantle with character or dress up your tree with personality. No matter your holiday decorating style, we have photo holiday ornaments that are sure to fit the bill. Custom photo ornaments are a fun, simple way to add your own personal touch to your holiday décor. We have so many options to choose from so any photo from your collection is sure to look amazing. Browse through your computer files or scroll through your phone’s camera roll and find some of your photographic favorites to create your own Christmas ornament masterpieces. Maybe you have an adorable photo of your newborn baby. Or, perhaps you have a great photo of the kids taken last winter while they were building a snowman. Commemorate them with your very own custom Christmas ornaments. We have a variety of ornament styles to choose from that are sure to compliment any picture from your collection. Some of our ornaments are available in a range of templates to not only accent your décor but your favorite photos as well. Fill up your Christmas tree this year with memories. From your best pet photos to your most prized summer vacation pictures, you can adorn your holiday mantle or Christmas tree with your life’s most beautiful moments. You can’t go wrong with picture ornaments if you’re looking to decorate your home in a unique way during the holidays. 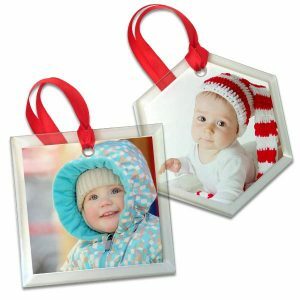 Grab some photos from your computer or phone and create the perfect custom photo Christmas ornaments. Our holiday ornaments are versatile and instantly show off your photos in a whole new way. Our custom photo ornaments are certainly a Christmas tree classic. Give your tree a little personality this year simply by showcasing your best memories. Create a whole set of unique photo ornaments and hang them on your tree to brighten up your home’s holiday décor. Not only great for your Christmas tree, you can also display your own ornaments on your mantle next to your family stockings. Or, hang them in your windows this holiday to give your home a fully decorated feel. You don’t have to stop at holiday décor either. Our photo Christmas ornaments are also great for the car. Print a favorite photo of your kids for the ultimate car ornament that will keep your memories close whether you’re driving to the store or taking a day trip with a close friend. With all of our custom options, the sky’s the limit. Maybe you’re looking for some great stocking stuffer ideas. Or, perhaps you have a few smaller gifts to get from your holiday shopping list. 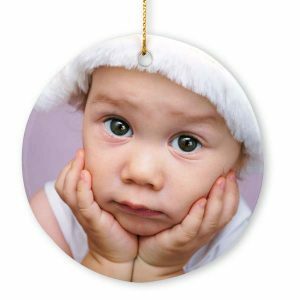 Why not create custom photo Christmas ornaments for the ultimate personalized gift. We have a variety of ornament styles to choose from so you are sure to find the perfect gift for anyone on your shopping list. Maybe you want to find a fun gift for your best friend, but you want to give her something a little more thoughtful and personal. She’s sure to love a personalized Christmas ornament. Search through your smart phone and find a favorite photo from a fun-filled weekend during the summer or a great selfie you took on a trip to the apple orchard this fall. Then, upload it to MyPix2 and select a photo ornament style that you know you’re friend will love. If you’re looking for great gift ideas this holiday season, why not make Christmas ornaments with pictures to give your loved ones a personal keepsake they’ll cherish for years to come. Many people like to collect a commemorative ornament each year. With our text feature, you can easily add your own message, date or name to your personalized Christmas decorations. Why not choose your favorite family photo and use to create a stunning ornament. Afterwards, add 2018 to your photo and voila; you have your very own collectible ornament that is sure to dress up your tree in style. We also have a classic annual Christmas ornament that includes a silver frame! Elegantly showcase your photo while creating a holiday keepsake that you and your family can enjoy each year! If you like canvas prints, then you’ll love our canvas ornament collection! Pick out a few favorite photos from your phone or Facebook and print them on our stylish canvas photo ornaments to give your tree a unique, personalized look. They’re printed on genuine artist canvas and are available in several styles so you can decorate your home this holiday with a personal twist! 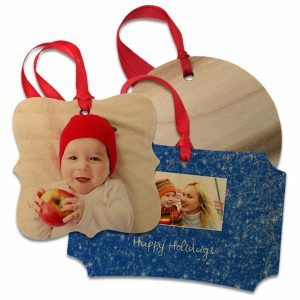 Not only can you customize each ornament with your photos but you can select from multiple sizes, shapes and materials to make your ornament truly your own. We have an ornament perfect for any decorating style and you can easily customize it using our convenient project builder. Maybe you like the look of a good old fashioned Christmas. Why not give your tree a more vintage look this year with our porcelain Christmas ornaments. 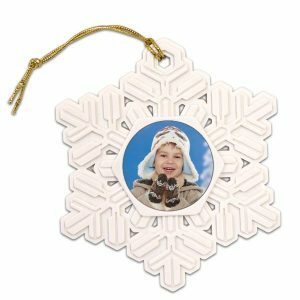 We have several styles including a snowflake ornaments and vintage postcard Christmas ornament that will give your holiday display a more classic feel from years past. In addition to porcelain, you can make metal photo ornaments for a little holiday shimmer. Select from various shapes with classic scalloped edges for that undeniably vintage look! If your home has a more contemporary look, our beveled glass ornaments are a great way to dress up your home in elegance. Not only do clear glass ornaments add a simple elegance to any display but they’re ideal for showing off your photos in full color and sharp contrasts. With their complimentary red ribbons, you can instantly hang them anywhere to add a modern, elegant touch to your personalized Christmas display. When we think of Christmas, images of roaring fires, gingerbread houses and more come to mind. Add a cozy Christmas touch to your home with our rustic style, wooden Christmas ornaments. Our wood ornaments are made from real maple and add a country flair to your Christmas tree. You can choose from a range of templates to display your photos and compliment your décor. Customers especially like printing family photos on our round wood ornaments. You can print a favorite picture edge-to-edge for a memorable keepsake that can be passed down to future generations! Keep spirits bright this holiday with our Joy ornament! If you like festive holiday colors, glitter, and photos, this is the ornament for you. You can have your photo custom printed on your ornament like a little cameo to add personality to your tree! Include wedding pictures, snapshots of the kids, or pet photos and make your Christmas tree uniquely your own! Whether you’re looking for a fun, thoughtful gift or want to add a little personality to your holiday décor this year, our personalized photo ornaments are sure to do the trick. Easily design your own ornaments in minutes by uploading your photos and using our project builder to customize your order. We offer a range of custom options that are sure to impress. Maybe you prefer wood, or perhaps you like porcelain. We have a custom Christmas ornament for everyone. Even better, they can be designed using your favorite photos. No matter your décor, our custom Christmas decorations are sure to add a unique touch that the whole family will love.